Buhleni Farm Chalets - Ezulwini Valley Accommodation. Tucked away on a bushveld fruit farm not even 5 minutes from the center of Ezulwini Valley, out of sight and away from the sounds of this travellers hub, is Buhleni Farm. The 12 self-catering well-appointed wooden chalets are set amidst lush, gorgeous, well established gardens. All chalets have 2 bedrooms, are fully self-contained and will sleep up to 4 people - extra mattresses and cots are available for the kids upon request. Accommodation comes with a daily maid service. Buhleni chalets are all set apart for privacy. Each has its own living room, breakfast nook, braii area & covered porch and comes fully serviced with linen, towels, kitchen facilities & cutlery. Some chalets equipped with DStv. Shopping, restaurants, International grade golfing, gambling, horse riding, craft stalls, beautiful bush, 4x4 trails and Mlilwane Game Reserve are all within 5km of Buhleni Farm. For parents wishing to golf or gamble in peace, Camp Kwena - located at the Ezulwini Sun Hotel complex - offers daily activities and entertainment for the youngsters. A wide variety of restaurants from jacket required to motorbike kit accepted are available in the Valley. You don't have to go out to get away! Lovely walks through 52 acres of forest, bush or our beautiful orchards will bring out the nature lover in anyone. 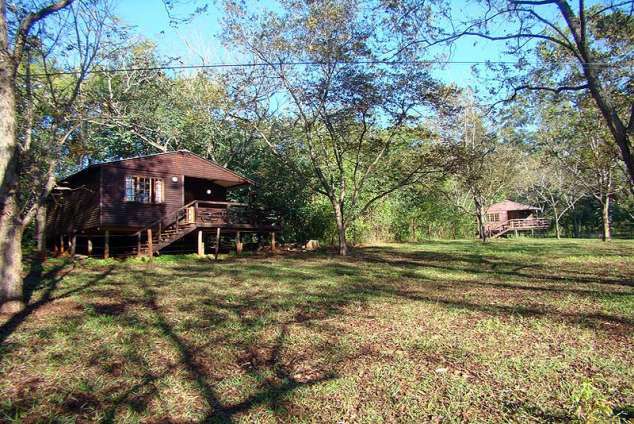 Abundant bird life, monkeys, mongoose and a wide variety of creatures live in the forests surrounding the chalets. The farm is fenced and patrolled by security staff at night and is a safe environment for children. As Ezulwini is in the middle of the main Mbabane corridor, Buhleni Farm is an ideal overnight venue for business people who need to be in touch with the major town centres. Group & agents rates available upon request. 41285 page views since 26 Nov, 2007.